Mary Berry (1935–) is one of Britain’s best-loved cookery writers and television presenters, most famous for her cakes and baking. She has published more than 75 cookery books and sold over 5 million – from freezer cooking and one-pot wonders to her iconic cakes and buns. Here you can find out more about the lady who has taught people to cook for over half a century! Mary’s great-great-grandfather was a master baker in Norwich in the 1850s. He provided bread for a local workhouse. Mary likes to start her day with Marmite on toast every morning. 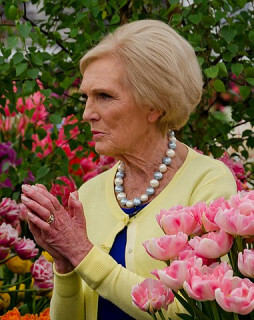 Mary Berry was born in 1935 in Bath, England. Her father was a surveyor and her mother helped with the bookkeeping, alongside raising the children. Mary loved playing outdoors with her two brothers, but at 13, she contracted polio and spent three months in hospital, separated from her family. She was left with a twisted spine, a thinner left arm and a weaker left hand. She became determined to make the most of every opportunity. 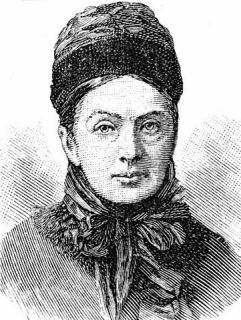 At 22, Mary moved to London, sharing a flat with four girls. She worked for the Dutch Dairy Bureau, demonstrating and developing recipes. Here, she persuaded her boss to fund a professional qualification at Le Cordon Bleu cookery school, Paris. There she stayed for a month in a youth hostel, hardly able to speak French, and so poor she mostly ate baguettes! On return, Mary became a recipe tester for the PR firm Benson’s. Then when Housewife magazine needed a temporary cookery editor, Mary’s boss recommended her and gave her leave to cover the position. This was Mary’s big break, and she later became cookery editor for Ideal Home magazine. In 1966, Mary married her brother’s friend, Paul Hunnings, and three children followed – Thomas (1968), William (1969) and Annabel (1972). Mary took just five weeks’ leave after each birth to ensure she kept her position at work. In 1970, the family moved to Buckinghamshire, and Mary’s first book was published: the Hamlyn All Colour Cookbook. The TV show – Good Afternoon – also ran a feature from Mary’s kitchen. Mary continued creating books and shows as her children grew up. Then in 1989, her son William was tragically killed in a car accident when he was 19. His sister Annabel escaped unhurt. William was visiting his parents from university and had driven with Annabel to the next village to buy a newspaper. To help get through her devastating grief, Mary found a job she could do from home. After the success of her Aga cookbook, she began Aga workshops in her kitchen. For 16 years, more than 14,000 people attended. She also made shows to accompany her bestselling books and launched a series of salad dressings and sauces with her daughter Annabel, which are now sold worldwide. At 71, Mary was ready to retire. But when a phone call asked her to be a judge on The Great British Bake Off, it seemed her career was just beginning! Mary became a much-loved member of the show and something of a style icon. In 2012, she was awarded a CBE for her services to culinary arts, and has received numerous other accolades, including a Lifetime Achievement Award from the Guild of Food Writers and an honorary degree from Bath Spa University (home to her former catering college). Mary regularly works on cookbooks with her assistant of over 25 years, Lucy Young. Can the children write a letter to Mary Berry, telling her about something they've cooked themselves, or if they've tried one of her recipes perhaps? Can the children design their own award for Mary Berry, to go with the CBE she received in 2012? Kids can learn how to draw Mary Berry with this fun printable step by step tutorial. Ask the children to colour in this picture of Mary Berry holding one of her delicious cakes. "Life is all about sharing. If we are good at something, pass it on." Here's a fun poster featuring a quote from famous chef Mary Berry, with a picture of two smiley face biscuits! Perfect to display in a kitchen, or anywhere! "Cooking and baking is both physical and mental therapy." I think many of us will agree with this quote by Mary Berry, but can the children write about what they think she means, then rewrite the quote in their own words? Use our Mary Berry story paper to write down a recipe from one of her television programmes, or to write her a letter! Do you know when Mary Berry first appeared on television, or when she first became a judge on the Great British Bake Off? Add these and the other important events in her life onto this timeline. We've hidden ten words all to do with Mary Berry in this word search grid - can the children find them all? Most children will probably recognise Mary Berry from her appearances on television, but can they write down what she is famous for, if they would like to meet her and what they would talk to her about? Maybe use our Mary Berry writing page for some copying work from one of her recipe books, or to write your own recipe inspired by Mary's cooking?